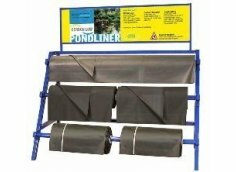 Choosing the Right Liner for Your Pond - PVC, Rubber, Or Mud? Choosing the Right Liner for Your Pond – PVC, Rubber, Or Mud? Every pond needs a liner to stop water from leaking out through the pond base. There are natural pond bottoms made of clay and there are artificial pond liners. Both effective in their own way and each with their own advantages. Pond algae removal is a not a fun process, so save yourself some time later and choose the right liner for your specific habitat. Think about it when opening your pond for spring. A good liner will not only contain water in your pond, but it will also help to keep sediment and other debris out to make it easier to maintain. Today’s modern materials are designed to withstand the elements and can last for years, but thinner materials can become brittle. Take into consideration your expected inhabitants for the lifetime of your pond, you might not always just want goldfish and a few ferns. Koi fish have different demands than a simple backyard water garden and the more affordable choices could lead to large algae overgrowth in the future. Examples of different thickness from .5mm to 1mm, choose based on the size of your pond and weather conditions. It’s a generally a good idea to order a liner slightly bigger than what you expect to need. This will allow you some extra slack to work with during construction. If you are unsure of the correct size a good aquatics retailer such as Swell UK can help you figure out the proper size and fit for your artificial pond liner. The most affordable liner is 0.5mm thick PVC. Great for those on a budget, and easy to repair with a patch should it rip. However, it does have its drawbacks. In colder weather below 8⁰C, it can become very brittle and tear if handled so try to avoid ‘in pond’ maintenance during the winter season. This type of liner is great if you have a very small feature or pond and is more malleable in the warmer weather. Thicker at around 0.75mm, this rubber pond liner is more durable and flexible than PVC. It is more expensive than PVC but is less likely to tear or rip during installation or maintenance. During the winter months it can withstand temperatures of around -40⁰C, so it can take the coldest weather. Great for large ponds, this thick rubber liner is the densest at around 1mm thick. Only the very sharpest objects can pierce it so it is unlikely to tear. Plus it has a long life, and is guaranteed for 20 years so although it is the most expensive, you do get fantastic value for money. As it is very thick, the liner can withstand freezing temperatures of around -49⁰C, so you can be confident that it will last throughout the coldest weather. Most pond liners can also be used to form artificial streams running through your garden. Pond underlay will help your liner’s lifespan. To add an extra layer of protection for your pond liner, underlay is a great idea. It provides a ‘cushion’ between the liner and the pond base. The materials are usually long lasting and will not rot or degrade easily, providing years of use. Many are rugged enough to keep tree roots and other sharp objects from puncturing the pond liner. If the ground in your garden is particularly stony, then using underlay is an essential geotextile material included in your pond construction process. It is wise to choose liners which are UV treated. Natural is the keyword in this sentence. Koi fish thrive on a setting with a natural bottom such as clay. It can often appear murky if the fish continuously stir up the mud but the health benefits of this material make this a beneficial solution to anyone serious about growing and breeding Koi fish. Top koi farms raise their Koi in mud ponds grow healthier, larger, and more vibrant fish. Mud ponds are usually a minimum of 5 feet in depth and provide Koi the perfect source for healing and nourishment. Observing koi in the wild shows us that muddy water is what they seek above all else. Especially if the Koi fish are wounded or have parasitic annoyances, they will seek out clay and mud environments. By creating a habitat where the Koi are comfortable, they will exhibit their most playful behavior. The fish receive the mineral nutrients needed to develop deep and vibrant colors as they mature. Mud ponds are overall the best choice for keeping and growing healthy Koi with the main drawback being that you can’t see the Koi at all times since they like to play in the mud. If you do choose to use a pond liner, do the koi a favor of regularly adding calcium montmorillonite clay to the pond on a regular basis. Whatever your choice for pond bottom, make sure you plan ahead for the necessary maintenance routines and the costs associated. Using a mud pond can reduce the need for extra pond additives or bacteria to keep your habitat healthy. Balance the food chain and reduce nuisance algae for a crystal clear pond with this simple additive. Replicate the water quality of a Koi breeder without the full investment in your pond features. Common algae growth like string algae is prominent on plastic liners, but can not be removed with an algaecide when there are fish. Use Nualgi as an alternative to clear your pond while keeping all inhabitants safe from harmful chemicals. It’s also an important asset against new pond syndrome – try Nualgi today!